Serenity Now Travel Blog: Last day before paradise! After my haircut, were I was successful at not involuntarily kicking anyone in the face, I headed home to watch Austin, my 16 month old nephew- my mom had watched him for me so I could make my appointments. I finished up some last minute packing while Austin chased Rocky, our 4.5 lb Yorkie, around with a wrapping paper tube. Once Uncle Matt got home he took the children, Bania our 55 lbs Olde English Bulldogge PUPPY, Austin & himself of course, outside to play so I could finish up cleaning up the house and have a moment of sanity. My mom stopped by to say goodbye since she's is not a morning person, to say the least, so she would not be accompanying my dad on the drive to the airport in the morning. Shanna, my sister-in-law, showed up to pick up Austin so we said our goodbyes and then we jumped in the car. Matt & I had the brilliant idea to start off our vacation immediately. We were headed to the Palisades Mall to have dinner with a great friend and then see the first showing of Iron Man 3 on Imax 3D. It was a great memory but my God did we feel it getting up this morning with less than 4 hours sleep. If only we had an 11 hour flight to recover on. Oh, wait. ;) Dinner was great and the movie was awesome. The funniest of the three, which I loved, because how can you not love Robert Downey Jr.'s cutting sense of humor??? 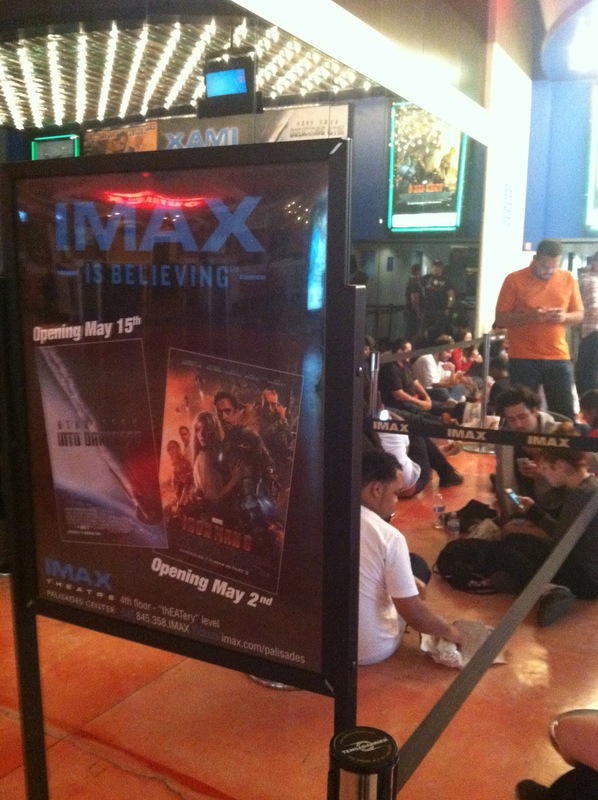 It was crazy though, because people who already had their tickets were still lining up over 2 hours before the movie. So I rushed thru dinner and left the boys hanging out to go save a spot in line. It was worth it, because there was no way I wanted to end up sitting across the theater from Matt. Mainly because I have a sever allergy to people. "Don't talk to strangers" I have taken to an extreme. I think maybe it's a New York thing, because whenever we leave NY I'm always amazed about how many random strangers talk to me. Haha. Anyway. 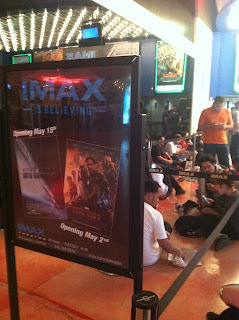 These people in the theater were probably proud members of the Tony Stark Fan Club. They were DRESSED UP in LIGHT UP, Iron Man COSTUMES. Yeah, thoooose kind of people. The last thing I wanted was to be wedged between to Iron Man crazies. Instead, thanks to my standing in line abilities, I was sitting between my two buds & Mr. Social Butterfly, Chatty Matty made friends with nearly our entire row while we sat in the theater for the 75 minutes before the movie started- they had open the doors that early to help with the line that was leaving the stanchions and starting to block the mall's walkway. While sitting in our row I realized again about how Matt has got to be the friendliest, extrovert I've ever met. He's such a nice, talkative guy. We are complete opposites. With strangers, I am the shiest introvert you'll ever meet. Opposites attract. Probably a good thing, because I can't imagine if we both were like me. Ha! After our eventful night we headed home, but not before Matt bought me a Coke Zero after I had just given him an entire speech about how I did not want a Coke Zero, but rather a water instead. It was very funny. You had to be there. Once home, I had forgotten our sheets in the dryer so I made the bed while Matt let Bania out & ran the dishwasher. We finally made it to bed & no, we were not too excited to sleep. We were exhausted! Next post... We're in Hawaii!